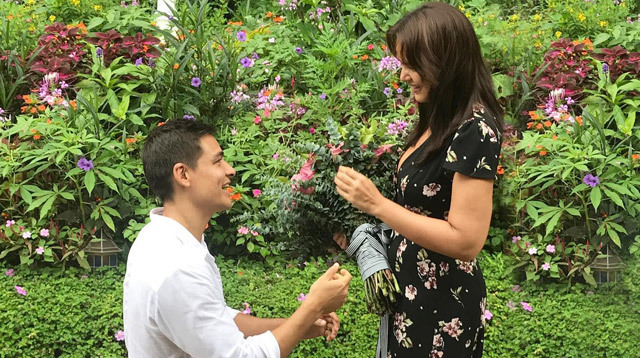 Iza Calzado just got engaged to her longtime boyfriend, British-Filipino businessman Ben Wintle! The announcement was made by Iza's good friend, fashion designer Rajo Laurel, on his Instagram account. On October 8, 2017, Rajo posted a photo of Ben, down on one knee, while Iza smiled at him holding a bouquet of flowers. Rajo captioned the photo: "IZA SAID YES! Congratulations to my friends @missizacalzado & @benmwintle on their engagement! What a blessing to witness this special moment in your lives. So happy for you both!" Iza and Ben celebrated their fifth anniversary together in January 2017. The couple's friends shared more pictures of the proposal—including a candid shot of Iza in tears and her gorgeous engagement ring from Ben!